Everyone was visibly shocked at what they’d witnessed, but on second thought, nothing was unexpected as the artist has been known for pulling all sort of stunts. At the Sotheby’s auction house in London on Friday, a Banksy painting self-destructed immediately after being sold for $1.4 million. Some experts and observers claim this to be Banksy’s most perfect art world prank. Just after the gavel fell during the auction, Banksy’s Girl With Balloon was reduced to shreds- another stunt in the disruptive career of the anonymous British graffiti artist. 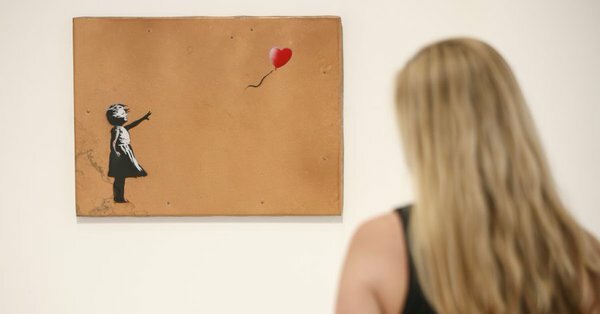 Sotheby's shared in a news release how the iconic image of a girl reaching out for a red, heart-shaped balloon self-destructed after being sold for $1.4 million. A shredder hidden inside the “artist’s frame” is the culprit behind the shocking but not entirely unexpected destruction. Banksy also posted a photo showing the stunned look of guests and spectators as the shredded art emerged from the bottom of the frame. The auction price of $1.4 million tied the artist’s previous record set ten years ago. It remains a puzzle, however, as to how exactly the shredder started operating at that crucial moment after the auction. One possibility is that it could have been activated by remote control. It is not clear how the winner of the auction reacted to the destruction of the prized piece of art, although there is speculation that the value art has doubled following the spectacle. People took to social media to share their various reactions to the event.